The Bengal School of Art commonly referred as Bengal School, was an influential art movement and a style of Indian painting that originated in Bengal, primarily Kolkata and Shantiniketan, and flourished throughout India during the British Raj in the early 20th century. Also known as 'Indian style of painting' in its early days, it was associated with Indian nationalism (swadeshi) and led by Abanindranath Tagore (1871-1951), but was also promoted and supported by British arts administrators like E. B. Havell, the principal of the Government College of Art, Kolkata from 1896; eventually it led to the development of the modern Indian painting. The Bengal school arose as an avant garde and nationalist movement reacting against the academic art styles previously promoted in India, both by Indian artists such as Raja Ravi Varma and in British art schools. Following the influence of Indian spiritual ideas in the West, the British art teacher Ernest Binfield Havell attempted to reform the teaching methods at the Calcutta School of Art by encouraging students to imitate Mughal miniatures. This caused controversy, leading to a strike by students and complaints from the local press, including from nationalists who considered it to be a retrogressive move. 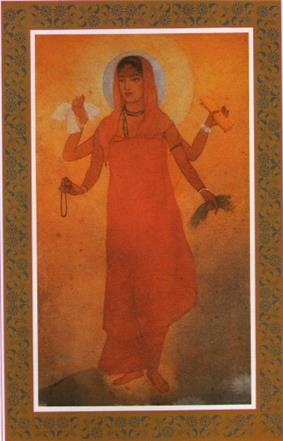 Havell was supported by the artist Abanindranath Tagore, a nephew of the poet Rabindranath Tagore. Tagore painted a number of works influenced by Mughal art, a style that he and Havell believed to be expressive of India's distinct spiritual qualities, as opposed to the "materialism" of the West. Tagore's best-known painting, Bharat Mata (Mother India), depicted a young woman, portrayed with four arms in the manner of Hindu deities, holding objects symbolic of India's national aspirations. Tagore later attempted to develop links with Japanese artists as part of an aspiration to construct a pan-Asianist model of art. Other painters and artists of Bengal school were Nandalal Bose, M.A.R Chughtai, Sunayani Devi (sister of Abanindranath Tagore), Manishi Dey, Mukul Dey, Kalipada Ghoshal, Asit Kumar Haldar, Sudhir Khastgir, Kshitindranath Majumdar, Sughra Rababi, Debi Prasad Roychoudhury, Bireswar Sen, Beohar Rammanohar Sinha, Kiron Sinha, Gaganendranath Tagore (Tagore's brother) and Sarada Ukil. The Bengal school's influence in India declined with the spread of modernist ideas in the 1920s. As of 2012, there has been a surge in interest in the Bengal school of art among scholars and connoisseurs. However Bengal continues to produce some of the best artists of modern India.There is a department in Govt.College Of Art & Craft that has been training students the traditional style of tempera and wash painting for almost a century now .These students are carrying the legacy of the Bengal School artists, who initially were a group of artists,following Abanindranath's style and sharing his aesthetic vision Among them Dhirendranath Brahma is the living legend of Bengal school of art.He is a master of calligraphy and has innumerable students who are carrying on the tradition of Bengal School of painting.Among the other renowned artists of this style of painting are Ajoy Ghosh,Sankarlal Aich,Amal Chaklader,Narendranath De Sarkar,Sukti Subhra Pradhan& Ratan Acharya. Some of the best known artists of present day Bengal are Arup Lodh, Ganesh Pyne, Manishi Dey, Shanu Lahiri,Ganesh Haloi  Nirmal Dutta, Nilima Dutta, Jahar Dasgupta, Bikash Bhattacharjee, Sudip Roy and Devajyoti Ray. Sanat Chatterjee is one of the last living pioneer of Bengal School of art. Studied under Asit Kumar Haldar around fifteen years. R. Siva Kumar, who has been studying the work of the Santiniketan masters and their approach to art since the early 80s, refutes the practice of subsuming Nandalal Bose, Rabindranath Tagore, Ram Kinker Baij and Benode Behari Mukherjee under the Bengal School of Art. According to Siva Kumar, 'This happened because early writers were guided by genealogies of apprenticeship rather than their styles, worldviews, and perspectives on art practice'. His ideas on this issue are formulated in the catalogue essay of the exhibition Santiniketan: The Making of a Contextual Modernism. ^ a b c "Showcase - Bengal School". ^ Mitter, Partha (1994). "How the past was salvaged by Swadeshi artists". Art and nationalism in colonial India, 1850-1922: occidental orientations. Cambridge, UK: Cambridge University Press. pp. 267–306. ^ Onians, John (2004). Atlas of world art. London: Laurence King Publishing. p. 304. ^ Mitter, Partha (2001). Indian art. Oxford University Press. p. 177. ^ Cotter, Holland (August 19, 2008). "Art Review: Indian Modernism via an Eclectic and Elusive Artist". New York Times. ^ Ghose, Archana Khare (12 February 2012). "For many art lovers, it's back to the old school". Times of India (New Delhi). Retrieved 8 March 2012. ^ "Shanu Lahiri dead". The Telegraph (Calcutta). Retrieved March 15, 2013.